This stained glass tutorial shows you how to solder hooks to stained glass so that you can hang your piece up securely. 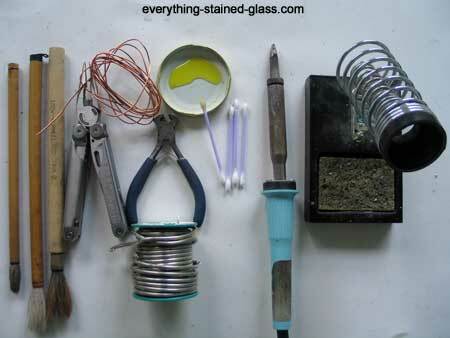 You’ll learn how to make recycled jump rings and how to solder them neatly to your stained glass sun catcher. Making sure these final touches are done neatly will make your work stand out from the crowd. Now you’ve created a lovely beaded solder around the edge of your piece, you’re ready to add the hooks. Ideally, these become part of your sun catcher, rather than just a means of hanging. Make them part of your design if you can. Wire cutters and Bamboo Brushes or similar for making hooks. You can make hooks yourself cheaply and easily. Either buy copper or tinned wire on a spool, or recycle electrical wire by stripping the plastic coating off with a craft knife. Be careful if you do this. Always direct the blade away from your body. 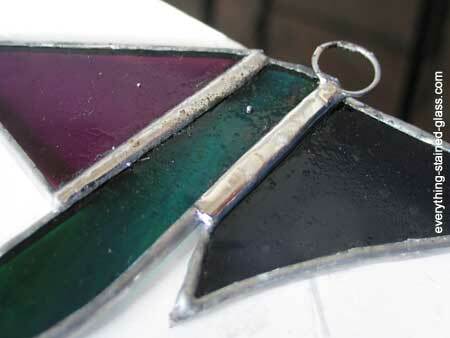 When you solder hooks to stained glass the hooks should always be soldered at a joint for strength. Never attach one on a beaded edge, as the weight of the glass will pull the foil off in time. Make sure you solder on a heat resistant surface. You need to tin the hooks first to strengthen them and to stop corrosion. That’s it, you’re done! If it hasn’t turned out as neat as you’d like, let the solder cool before melting and having another go. Don’t re-do too often as the foil will start to come away from the glass. Everything may look a bit messy at the moment, but that will soon change because now you’re ready for the final stage, Patina and Polish. You’ll soon end up with a sparkly finished panel to be proud of. If you need more instructions on the copper foil technique there’s a list on this page. Go to Everything Stained Glass home page. Hi. I’m making lightweight sun catchers and there is not asolder seam at the top. I’m not sure how to place the hook. I keep trying to paste a photo but I can’t. It’s a sun catchers if a police badge. It depends on the design as to where the jump ring will go. After time any weight will pull the edging foil off so you do need to attach it on more than the outer foil. The safest way would be to attach copper wire around the perimeter of the stained glass sun catcher and fix the jump ring to that. You sound as if you have a great deal of determination Mary Jo! I’m glad to hear that you have managed to pick it up again and I hope the same can be said about your sewing. Thanks for your lovely comments about my site – you’re most welcome to visit anytime! Milly, in your tutorial about making rings for hanging, you do everything I do and it works very well. I do have one suggestion that might be helpful, however. If you tin the wire before wrapping it around whatever you use to make the rings, it saves a lot of time and I have found it is much easier to tin the whole wire rather than one ring at a time. Thank you for your very helpful suggestion Paul. I have a video showing how to tin a length of wire – I should find it and put it on this page. Thanks for helping everyone out.